Today's guest post by Monica can be considered a follow-up to the series of posts that began here in April 2014. 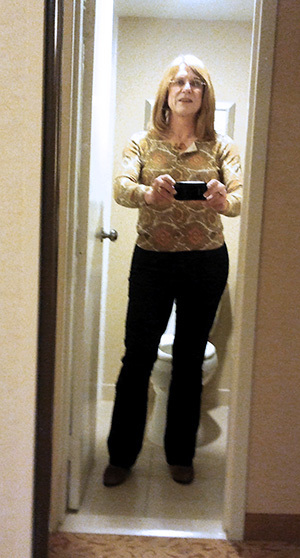 I recently went to SF and then on to Denver to go to Art of Feminine Presence (AFP) Training. I have a theory, if you want to learn Japanese, you do not go to Japan and hang around with Americans. Similarly, if you want to get in touch with you feminine essence, hanging around with cisgender women is likely to be more productive than hanging around with transwomen. I am just saying! Get outside your comfort zone and you will be amazed at what you can achieve and learn! Before my recent trip to SF and Denver, I was a nervous. Despite being out in public (a couple of times a year) for five years, I was always on the lookout for people watching me. I cringed internally when people looked at me a second time or gave me anything more than a cursory glance. Being in my womb space (as we call it in AFP – power centre in Feminine Power, etc... I do a lot of these feminine courses… LOL!) lessened the discomfort, but did not eliminate it. When in SF, I went for laser treatment on my beard and was in guy mode for that time. Going to and from the clinic, I noticed (for the first time – how dumb is that?) that people look at me and everybody else, no matter how they are presenting. People are curious and enjoy looking at others. Had I been in girl mode, I would have flinched and been upset. I realised then that it is my response that was causing the problem. This led me to thinking that I was setting the bar too high for myself. I was setting being a cisgender woman as the target and when I failed, I was getting upset and depressed. The realisation struck me that no matter what, I cannot be a cisgender woman. My hands are too big, my feet are too big and my facial structure is wrong. In short, my anatomy and my history are wrong. Hence, the target is not really achievable: even with hormones and surgery I will still fall short. I have to accept that I came to this place of the feminine through a different route than cisgender women. That does not make me any less of a woman, just a different sort of a woman. I am a transgender woman and need to accept that as my reality. Because no one person encompasses all of the feminine – the feminine being too big – my part of the feminine is as good as anybody else’s. I am different but equal! I realised that the best I can be is a transgender woman. I have to accept that as the foundation of my existence. At this realisation, a huge weight fell off my shoulders – why has it taken me so long to see this?! I could now set my target as being the best transgender woman that I could be. This, at least, was an achievable target and I could get into just being myself and enjoying being a transgender woman. I love being the woman I am; I do not know why I am like this, but I know it feels like home to me. At the AFP event in Denver, I normally would plague my sisters for feedback on where I was falling short in my presentation as a cisgender woman. This time, I don’t believe I asked even one person. When I went to the Denver art museum with my friend Leli, people looked at me, but it just did not bother me. I just enjoyed being the woman I am. On the last night in Denver, when I came back to the hotel, the bar was surrounded by men – a fireman's convention! A couple of weeks ago, I would have turned tail and headed for my room. This time, I just got into my womb space, touched base with enjoying myself as the woman I am and strode confidently up to the bar and ordered a glass of pinot noir. The barman knew I was different as he had seen me there a few times before, I did not care. I did the best I could and enjoyed it. Nobody even looked at me! I took my wine back to my room and toasted my new found joy! How this applies to my project of finding the gift of being transgender, I am not sure, but I will keep on looking! He was the only male that responded. The other 13 replies were from my AFP sisters telling me how they supported me and how me, just being my female self, was a great inspiration to them. What more could a transgender woman ask for? If I can do it. so can you. I am nothing special, I can assure you! True, it is by being with women tat we develop our womanhood, playing in an all woman orchestra was a real breakthrough for me in understanding the difference between performing as man and authentically. Great post and a good note about a wonderful moment when you realize that the best you can be is a transgender woman. Enjoying your life as a transgender woman is healthy. Striving to be something that you can never be, cisgender, is not so healthy. Thanks for sharing your feelings and reflections with us Monica. I've found that we all blend in more than we think - most people are just going about their day and don't really take in their surroundings all that much - in fact I believe just 25% of people are in the category of those who are more observant and more attuned to details. 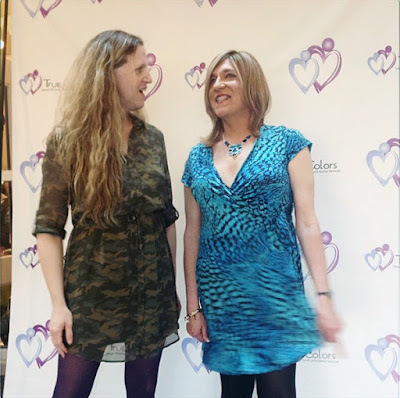 I'm glad to hear that our mutual friend Kathe is still involved with our community - she's one of the first cisgender women I met when I was finding myself 15 years ago.